Empathy. (Don’t roll your eyes.) People often call it a ‘soft skill’ – and the underlying implication is that ‘soft skills’ just aren’t as business critical as other skills. A few weeks ago, Pepsi found out exactly how critical this ‘soft skill’ is to business. If you haven’t heard, they launched this ad, featuring Kendall Jenner. And then they immediately pulled it because of the outrage from social media (click here for an article that includes some of the scathing tweets). On the one hand, I can understand Pepsi’s misstep. There has been a noticeable increase in product and service ads that feature social issues. There was a wide range of them during this year’s Super Bowl…so many, in fact, that Saturday Night Live even got in on it. The question then is why were so many of those ads well received, while this one fell as flat as that lone Pepsi left in the cooler for days after the party? To understand that question, first look at this picture of a woman in Baton Rouge last July, who was arrested in front of an entire lineup of officers in full riot gear. Pause for a minute, put yourself there, in that moment. What must she be feeling? What is it like to be her? Empathy is being connected to what it must have been like to be this woman…and honoring, validating, and legitimizing that experience. 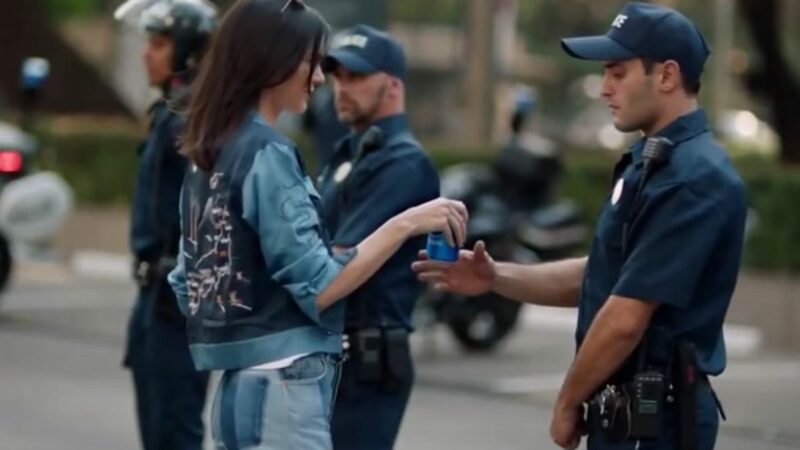 To suggest that if she’d had a Pepsi, everything would have turned out just fine lacks an emotional connection to what it must actually feel like to be a black woman at a protest in Baton Rouge, Louisiana in front of a line of law enforcement officers. What does it look like to put yourself in the other’s shoes? A couple of weeks ago, Heineken released this ad, called Worlds Apart. It shows pairs of strangers, who unknowingly have vastly different world views coming together and getting to know one another…and perhaps becoming at least interested in another point of view. There are critics that say this ad is also terrible: it doesn’t take on some of the toughest opposing views (racism) and that it gives air time to bigoted points of view. In contrast to the Pepsi ad though, it does have people see where there is common ground so that they at least get interested in what it might be like to have a vastly different perspective. If we are going to solve the most intractable problems, I think that’s where we must start – I may not share your point of view or agree with it, but can I understand that for you, the point of view is important? Before I try to influence your thinking. Well beyond crafting an ad, having some empathy for what it must be like to be someone else is critical for leading organizations. If you want to implement any kind of change, you must understand what the people you are asking to change must feel like. Too often, leaders step over this in the exuberance for getting results…and as a result they meet resistance head on. And when they meet that resistance, they frequently just push harder (repeating the same messages over and over…or louder and louder)…causing more resistance. And so on, and so on, and so on. To move beyond that cycle of doom (or maybe it’s a cycle of dumb), requires empathy: getting connected to what the other is experiencing. And that will often require some research: what is critically important to them? what are they worried about? what do they wish other people understood about their situation? This is a great place to start building that empathy muscle. Which it turns out isn’t such a ‘soft’ skill after all. If you’re interested in learning more about how to create strong connections so that your organization can get more done with less time, money AND STRESS – our upcoming one day event in Atlanta, The Executive Garage, might be a great start.